Kullu to Rohtang on a 100cc bike! The best is yet to come, I say always. But so far this has been the most memorable & adventurous drive of my life. We had been married for 4 months & were out on a family holiday to Kullu. While the family was busy chitchatting with our host’s family, we sneaked out on the pretext of seeing Manali & be back by evening. They didn’t know, we had other plans…adventure buffs, we wanted to drive to Rohtang Pass, if not Ladakh! We were on an old 100cc bike! Passion holds no bounds & both of us were burning with passion to reach Rohtang on that old bike itself. We asked a cabbie if the bike would manage the drive. He gave one look and said “Oh Yes”! A few kilometres down the route, we seriously doubted the authenticity of the cabbie as our bike wouldn't just go. Falling down & getting up again, like brave soldiers, we too didn’t give up. The hostile terrain was complemented by the fragrance of romance in the air. With no other vehicle around during most of the trip, I managed to keep Mr. Hubby alert by singing “Tere Mere Sapne” from the movie Guide. And he soon joined me. Everytime we fell down, it hurt, but the feeling of having someone to hold your hand and motivate you to get up overcame the pain of the scratches. As we neared Rohtang, we spotted a bus going towards Ladakh. Seated next to a window was a woman in her traditional attire. She uttered something as she looked at us. Unable to comprehend her, I could just give her a helpless smile. In an unknown place, on an unfriendly terrain, here was an unknown lady giving me a warm smile & I reciprocated wholeheartedly. A few kilometers before Rohtang, I saw some people paragliding. But despite my repeated pleas, Mr. Hubby kept his presence of mind intact & reminded me of the riskiness of the trip. Already on a super duper machine, we had to reach Rohtang & be back before sunset, as our family was in the notion we were in Manali. 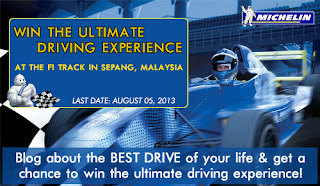 Honestly, the vroom of the machine & rush of adrenaline made me feel like a teenager who was eloping with her boyfriend. Only difference, we were in our 20s & Mr. Hubby was the BF! By 3, we reached Rohtang. Have been on many trips before, but this one felt like a great accomplishment. 30 minutes of some clicks in the snow cover, quick bite & we were on our way back. Though we did reach after sunset & finally had to spill the beans to family, this trip is something Mr. Hubby & I can never forget. The mean machine & the rush of adrenaline! A chance to win a trip to <a href="https://www.facebook.com/MichelinIndia/app_478302922255960" title="Michelin Pilot Experience"
With great pain my heart was filled. 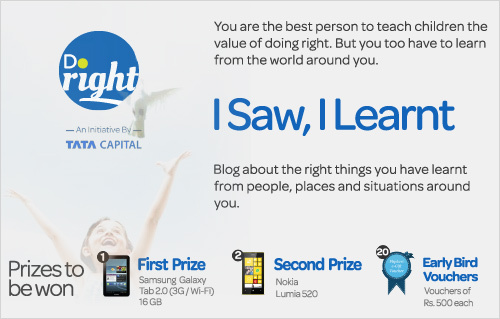 with <a title="Do Right! " 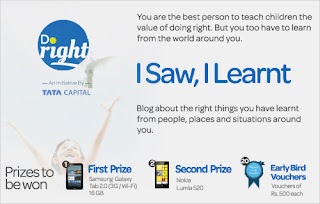 href="http://www.doright.in" target="_blank">DoRight.in</a>. I had been eagerly waiting for this one. There’s something about biopics that give you a kick, hard enough to bring some action in our otherwise mundane lives. Years ago, I saw I saw Chak De while preparing for CAT exam. 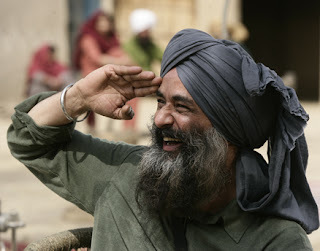 Then came Paan Singh Tomar which left Mr. Hubby & me with a village dialect only the 2 of us could converse in! 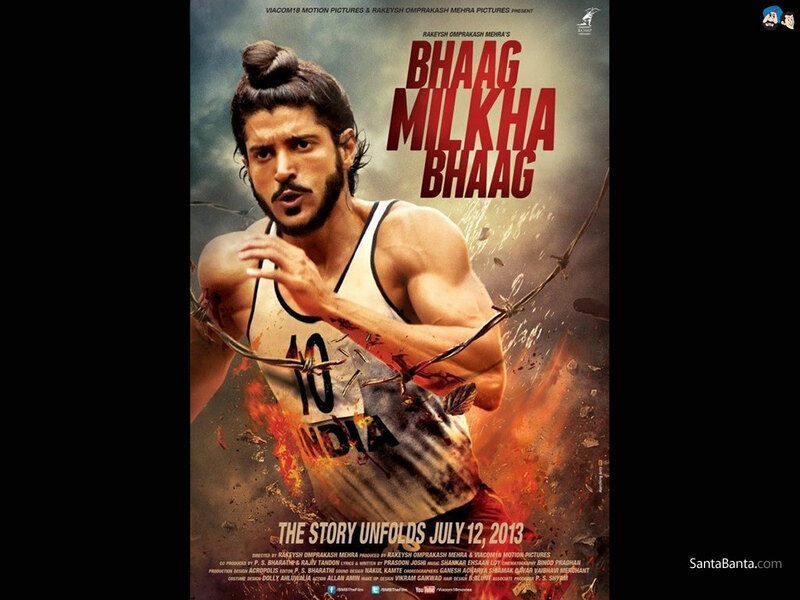 So, I was waiting with bated breath as to what Bhag Milkha Bhag would do to us. And it surely did. What? Well, you gotta read my take on the movie first. 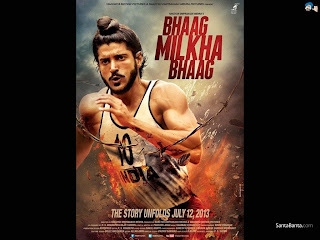 Bhag Milkha Bhag is a sincere effort by the director to serve simple story of The heroic flying Sikh to the masala hungry audience. While on most occasions he has managed to weave emotions with rush of adrenaline moments, there are sequences which should have come under the scissor of the editor. Keep it short and sweet. 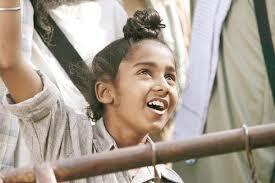 But a Director who has doled out masterpiece like Rang De Basanti surely knows his act right. So just when you feel the movie is getting slow, the wisely chosen starcast pull it off with finesse. While Farhan Khan’s performance speaks for itself, watch out for power packed performance by Art Malik, Master Japtej Singh (who plays the young Milkha), Divya Dutta(plays Milkha’s sister) & Pavan Malhotra (who plays Milkha’s coach). As the movie began with the 1960 Olympics and quickly got layered in flashbacks, I was hoping the Director would return with the sequence in the later half. But rather than sulking about the lost glory, the movie takes an optimistic turn and showcases the struggle of a man who lost everything yet had the grit to take on any challenge. Be it the challenge to survive in the 1947 rights, the challenge to outdo the reigning athletics champion or overcoming the inertia of the past to travel to Pakistan for friendly sports series. While Mikha’s stint during the Army training leave you laughing, the brother sister moments are performed flawless enough to moist your eyes. The director making a guest appearance as captain of the aircraft reminded me of Subhash Ghai movies where he too used to appear 2-3 min guest appearances. It in only after the interval that you start looking for something to keep you hooked on. But that’s how biopics are – not for the masses but the classes. Sonam Kapoor plays the girl next door to the best of her bandwidth, which sadly is cut short to make way for the Australian girl Stella (Rebecca Breeds). The first song with Sonam-Farhan feels like a gush of fresh air however, from then onwards, their chemistry gets boring and you can’t help but wait helplessly for the next frame to save the movie. I was super excited to see Meesha Shafi (of Coke Studio Pakistan fame) in a Bollywood movie. Alas, before I could understand what she was there to do, she was gone! We need some more dialogues next time Meesha! Art Malik was a surprise package. Despite being a Pakistani British actor, he has done full justice to the role. One can make out that he is enjoying every scene to the fullest – the recipe for a perfect act! Some scenes like the scene where Milkha wins a race despite being badly injured are signature Bollywood style. You know for sure they are there just to give our hero, some steroid dozes of super heroism! But when Prasoon Joshi has to tell a biography Bollywood style, you can expect melodrama here and there! All in all a good movie sans the occasional drags. Don’t draw comparisons with serious cinema like Paan Singh tomar or you will be disappointed as this is Bollywood genre altogether. Go for it and get inspired by the real hero himself with his real stunts and real struggles! As for the effect of the movie on Mr. Hubby & I, we took 4 full rounds around Lodi Garden (with some sprint as well!). That was some effect indeed! A funny sight today reminded me of the lesson about Charles Darwin’s theory of natural selection I learnt in school. While corporate life is the best way to explain the survival of the fittest theory, there are many a lessons to learn outside the board room! Saw this cute doggie outside office this afternoon. While the hot n humid weather is driving Dilliwallas crazy, this doggie decided to take things in his stride. 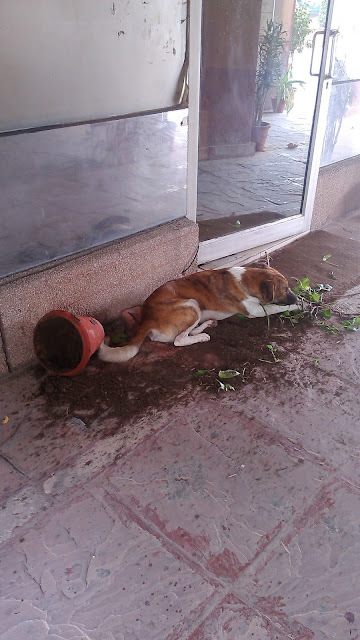 He broke a pot and as the soil scattered around, he made himelf comfortable on the bed of soil! My camera couldn’t resist clicking this one! Any suitable caption that comes to your mind? Prayer or just a mobile ringtone? On a lovely morning, when one boards the overtly crowded Delhi metro, some breathing space and no nonsense neighbors is what one hopes for. Some days are lucky, and some, well, lucky for others. As I boarded the usual morning metro from Rajiv Chowk this morning, I was greeted by a bright gentleman with an “X-Ray vision” (The way his eyes were checking out each every girl entering the coach would put any metro security guard to shame). But being from Delhi, this is a usual affair for me, so I quickly made way towards the opposite pillar and immersed myself into the book in hand. Suddenly, the sound of Hariharan enthralled the entire coach. He was singing the Hanuman Chalisa, and on a busy morning, this sounded like a treat to my ears and I closed my eyes enjoying the Chalisa (prayer). But, he had merely sung half the beginning shloka when he was interrupted by a loud “Hullow” and some stuff like “Hum 15 minute mein office pahunch jayenge (will reach office in 15 minutes)”. Knowing for sure that Hariharan wouldn’t have sounded like this, I opened my eyes & discovered that this was the voice of the same Mr. X-Ray vision. The not so gentle man had chosen Hanuman Chalisa as his mobile ringtone and the prayer had been interrupted as he had received a call. This isn't the first time that I have witnessed something like this. Often I see people choosing religious prayers as their ringtones and the calls are almost always answered before the prayer or shloka is complete. In Hindu religion, it isn't considered a good practice to leave prayer incomplete as it is believed to annoy the concerned God/Goddess. Sounds logical as well. 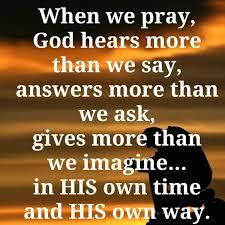 Prayers, I believe were created out of man’s respect and affection for God. If you decipher the lyrics of any prayer, it praises the lord for the way they have cared for the world and request them to continue to do the same. Like love, devotion can either be expressed or implied, but if one chooses to express it, one should ensure it isn't done halfheartedly Imagine how would you feel if you are waiting to hear some magical words from your beloved and all s/he says is something incomplete and leaves in between. Instead of invoking feelings of love, it would be considered rude and would annoy you. God, too, has a heart, even though much bigger than us. And if we truly love God, we ought to care about his emotions as well. As the great Karl Marx said, “Religion is the opium of masses.” True. Religion drives so much around. For some, religion is felt from the heart, and for some, it’s a way of expression, and they openly flaunt it, as if to prove their kindness and piousness. But by keeping prayers as mobile ringtones and not showing due respect, what message are some people trying to convey? That they are too busy to thank God in the proper manner, or they are great enough to remember God in a half baked fashion, despite their busy schedules? God has created this beautiful world, and all he wants is to be remembered wholeheartedly, even if silently in heart for few minutes a day. In this big bad world in the peak of Kalyug, when everyone is mesmerized by materialism and selfishness, the least we can do is to do something only if we can show true respect. Else not go for it. God wouldn't mind if you remember him once a day. But he would for sure feel disappointed if we make his prayer our mobile ringtone when we can’t give due respect to the prayer. So, for people like Mr. X Ray eyes I met this morning, please make prayers as your ringtone only when you know your karma ledger is clean and you can give respect to God, his prayers and his creations. As I write this blog, I also want to clarify that I am not writing this as a representative of God, because he exists within us all. But, yes, I love God and I know the first rule to love someone truly is to show true respect and make a commitment only when it can be fulfilled. There are movies you watch and forget. There are movies you begin on an excited note and then lose the tempo. There are movies which begin on a slow note and the crescendo builds up. And then, there are movies you begin with and wish they would never end. Coz there’s something in them that strikes a chord. 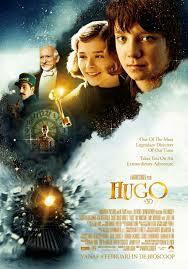 Hugo is one of those movies I began on a somewhat reluctant note and as the movie progressed, I relished each and every frame. Just wished the movie wouldn’t end! Me not being very enthusiastic a person about the adventure drama genre, it’s my nephew who almost forced me to watch it. Good he did. For, the movie, based on the novel “The invention of Hugo Cabret” by Brian Selznick is one of the finest 3D movies I have ever seen. Even before the starring began, the cinematography had already played its charm. The movie, set in Paris revolves around the life of Hugo Cabret (Asa Butterfield), a bright boy living a simple but happy life with his father (Jude Law), who works at a museum. 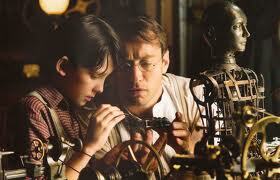 The father son duo have a thing for fixing machines & the father often explains the beauty of clock work to Hugo in different devices. One day he finds an old, abandoned machine called automaton & along with Hugo, takes up the challenge of fixing the automaton. But even before the automaton comes back to life, tragedy strikes them. Hugo’s father dies in a museum fire and overnight, the pampering and love gets transformed into a lonely, orphaned life with a lot of unanswered questions. 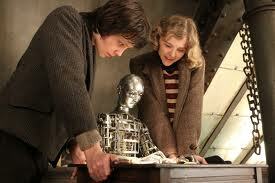 The automaton is Hugo’s only companion, a mystery he is determined to solve as his belief is tied with it. 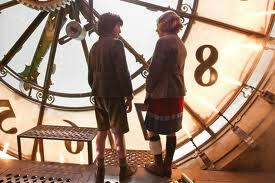 Hugo is taken by his alcoholic uncle Claude and taught to maintain clocks at railway station. The uncle soon disappears and Hugo lives a lonely life in the clock room, escaping the station master who is always on the lookout to send orphans to where they belong-orphananage. Hugo’s sole mission is to decode the unsolved mystery the automaton beholds & he often steals part from a toy store for his repair work. But life has other plans for Hugo Cabret. 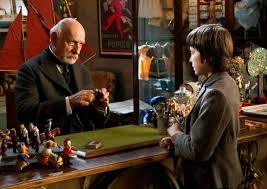 The toy shop owner, Papa Georges (Ben Kingsley) catches him red handed stealing parts and takes away his notebook where his father had made notes about fixing the device. Hugo is determined to get the automaton fixed, and his determination takes him close to Papa Georges, who gives him work at his shop. In his lonely world, Hugo finds a friend in Isabelle, Papa Georges’ god daughter, who has been kept away from the glitz and glamour lives in the world of English literature. It’s a treat to watch the way she uses unusual words on the usual occasions. Their friendship soon spreads its wings with Hugo introducing Isabelle to the world of cinema and Isabelle introducing Hugo to her literary interests. Hugo is surprised to find that Isabelle wears a heart shaped key as a pendant, a perfect match for the heart shaped lock in the automaton. He convinces the adventure hungry Isabelle & using her key, is able to run the automaton. 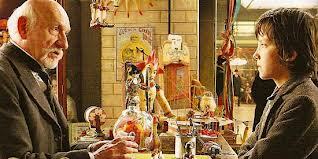 But seems the questions only get bigger, coz upon being started, the automaton scribbles an image & even signs in the name of “George Melies” that Isabelle immediately recognizes as that of Papa Georges’. Unable to come to any conclusion, Hugo & Isabelle decide to probe further as the involvement of Papa Georges makes them even more inquisitive. Papa George and Mama Jeanne meanwhile are in a complete denial mode and Papa George even fires Hugo from his shop for having broken his trust. But Hugo & Isabelle are far from discouraged. 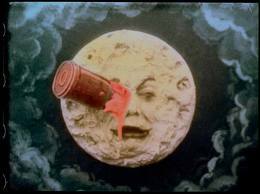 Their curiosity takes them to the library where they discover the image drawn by the automaton was in fact an image from a famous George Melies movie, Voyage to moon. They are surprised to find out that Papa George, alias George Melies had been a famous filmmaker of his times, known for his movies full of fantasy & imagination. The author of the book is a big Melies fan himself. And so when the kids tell him Melies is alive, he is more than happy to help them connect the dots. As the author comes face to face Mama Jeanne at her house, the story takes a new turn. Mama Jeanne had in fact been a famous actress of her times. As Melies walks unannounced into the secret filming of his movie in the living room, he breaks down & remembers the ups and downs in his life. How a successful director, known for transforming imagination into movies, falls prey to the change of times when after World War I, there are no takers for fantasy. Ben Kingsley once again proves his mantle as he plays the perfect part of a loser who had sold everything to survive in the big, bad world, selling his movie films to a company that melted them to make shoe heels. The story begun by the scribbling of the automaton, ends on a happy note, with Papa Georges getting his lost glory back & Hugo no longer being an orphan. As he is finally caught by the station master, Papa Georges comes just in time & says “the child belongs to me”, freeing Hugo from the label of “orphan” & giving him a new life. Hugo has finally found a message he had been searching for in the mystery of the automaton, the message of a new life and rising up from the ashes to a life of happiness and fulfillment. You will love the movie for its immaculate cinematography, intensity of the acts and the flow that the director has managed to keep going throughout the show! No wonder, the movie won 5 oscars at the 84th Academy Awards in 2011. As a newbie on blogosphere, I used to see the Liebster badge on a lot of blogs & wonder what it was. At first, I thought it to be something Deutsche (since Liebster in German means “dearest”) and I became even more curious. Then slowly, as I became familiar with BlogSpot, I discovered it is an award to encourage upcoming bloggers who have less than 200 followers. As any new blogger would agree, in the initial phase, every follower, every comment is a prized possession, and I remember checking my blogger dashboard before my mail every morning to check for any new comments. And when good comments poured in, they just made my day…Well, they still do & even now, my blogger dashboard takes precedence over my mail! So, engrossed deeper in the joy of writing, I soon graduated out of the “when will I” phase. And finally, I get my first Liebster! 11. Would love to have the largest possible collection of sarees in the world! Coz I truly, madly and deeply enjoy blogging! Thanks Niranjan for the nomination! I enjoyed answering the questions…. :) And as for passing the baton, well, most of the bloggers I know have already received Liebsters from other blogger friends, so I will have to rack my brains to come up with some names! Though we aren’t typical fitness buffs, Mr. Hubby & I do have frequent bouts of fitness consciousness. 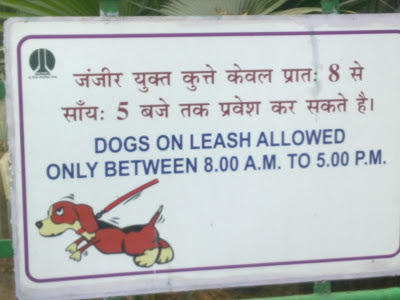 That’s when we head to the various magnificent parks of saadi Dilli for a good walk. The one that’s my favorite is Lodi Garden. With a boasting variety of lush green trees, white ducks lazying around in a beautiful manmade lake, kids playing around, fitness freaks sweating it out, Lodi Garden surely is a prized possession of Delhi. A recent visit to the Garden though, inspired me to reveal another quality of Lodi Garden – a regular hangout for youngsters who are unaware of their shame quotient. Sometimes shooting hormones overtake the shame quotient and the couples run on the highway of lust, hoping to be embraced by Cupid himself! Sounds funny? Well, last evening, as I went for the usual walk, the scenarios I witnessed gave me the perfect masala, and being the crazy greedy blogger, anything and everything the brown eyes see, the hands quickly blog it down. Well, before telling you about what exactly happened, it’s important to give some more insights about these couples. Normally, a sultry summer day would keep us within the confines of our homes. But for these hormone driven souls, the wrong is right. Bad weather is the perfect weather; coz it ensures no one’s watching their coochy cooing. So you will spot more action behind the bushes on a bad weather day than on a pleasant one. Is it shame quotient or fear of being caught – only they can answer & I have honestly never bothered to ask. So, last evening, 100m down the jogging track inside the garden, I spotted something in bright maroon behind the bushes. Having read recently in the tabloids about an eve teasing case in Lodi Garden, I decided to find out. To my surprise, the lady in maroon was comfortably seated on the lap of her beau, enjoying perhaps the smelly bushes and the boundary wall view. (Can’t really explain it all here, please feel free to estimate what I actually saw). Here I was thinking someone needed help whereas that someone herself was lending a helping hand. Seeing the angry me heading towards them, Mr. Hubby immediately took charge and told me not to interfere in someone’s private matter. “A private matter in a public property! Filthy!” was all I could utter in the loudest possible tone before Mr. Hubby took me away from them. Seems the show had just begun. Few meters ahead, again in the bushes, I spotted a scene, more interesting than the previous one – one beauty serenaded by two guys. Usually, there is only one hero but hats off to this girl for smartly managing two of them. I wasn't ready to believe, so standing on the jogging track, my eyes searched for the 2nd gal. But soon I realized standing there would have meant making a fool out of myself. People passed by and nobody bothered to look that side, then why do I waste my time? Let it be, I thought and ran to catch up with Mr. Hubby who had by now jogged way ahead of me. The picture was far from over. For behind almost every thick tree, I could easily spot action, even from a distance. And we even got to witness the typical climax ala Bolly wood style. Just as we crossed the jogging track near Tomb of Sikandar Lodi, my eyes saw the impossible. A couple was rolling away in the park. The shame quotient had gone so low that they didn’t even bother to hide behind a tree. The scene reminded me of the Sridevi starring “Nagina” movie I had seen as a kid, where two snakes rolled away non-stop when fighting. This one of course was far from fighting. Two fat aunties walking in the park too stopped and began looking at them in horror. A couple playing nearby with their kid quickly took the child away. This time I decided neither to give up nor to wait for a guard to come and shoo them away. Moving a bit close to them, I gave them a continuous stern sixty year old auntie look, till the snakes quickly went out of sight. As I walked, I wondered was it the sense of shame that makes such couples find cozy corners in public parks or the lack of it that makes them give in to their hormones in the first place! 3. Charge at them, claiming to be from a moral policing organization. 4. Just ask them to leave and go to a park where there weren't any kids. Wondering what I eventually did? Well, nothing, for I saw a bunch of drivers enjoying the matinee show by peeping from the boundary wall. The couple of course was oblivious to the uninvited guests.